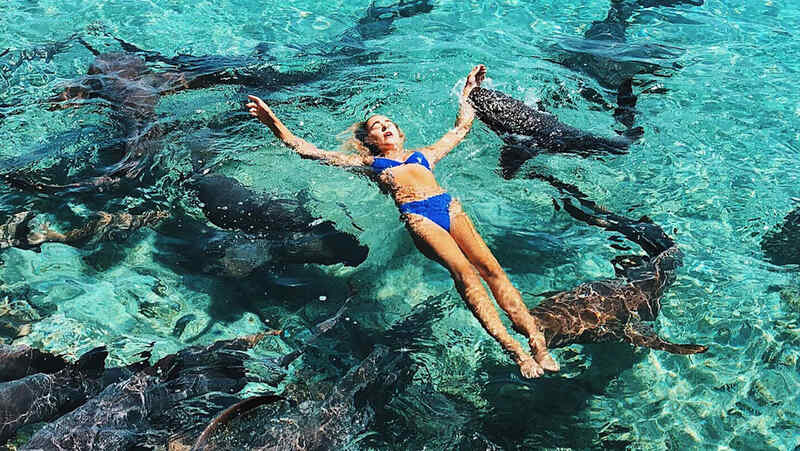 The model Katarina Zarutskie visited the islands of Exuma, in the Bahamas, with her boyfriend and his family, without imagining that he would live a terrible experience under the sea when being bitten by a shark. The young woman observed that there were several people practicing snorkelling and interacting with a group of nurse sharks in the area of Staniel Cay, so she wanted to take some pictures there, despite the concern of her boyfriend’s family. “As I have previous knowledge of surfing and diving, I know that nurse sharks are normally safe. I’ve seen numerous pictures of people swimming with them on Instagram, “Zarutskie told the BBC. The model reported that after posing for a few minutes in the water, one of the witnesses encouraged her to float on her back so that the animals appeared below her and then one of them pulled her. The shark kept the model several seconds under the water until she managed to pry the wrist from her jaws. The accident was captured in several images that were taken by her boyfriend’s father. In one of them, it is observed that Katarina raises her hands and covers the wound of her left wrist to prevent the blood from falling on the water. “At that point, your body has so much adrenaline and you just want to get out of there, but I was extremely calm,” said the 19-year-old. After leaving the water, the model received several stitches and an antibiotic for her wounds. According to the British site, she still has tooth remains on her arm, but she feels blessed that things did not turn out worse.